A day after Quebec Premier Philippe Couillard urged Quebecers who have left the province to return, 50 Anglophone university students gathered to discuss their future in the province. The students were taking part in the inaugural Bishop’s Forum, a week-long conference on civic engagement. 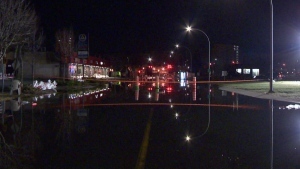 Among the speakers were former premier Jean Charest, D’Arcy McGee MNA David Birnbaum and prominent Montreal attorney and political advisor Eric Maldoff, each of whom addressed the Anglophone community’s present and future. Maldoff was critical of Couillard’s appeal to the Anglo diaspora, saying any words must be accompanied by concrete action. He pointed to a recent mistake in Statistics Canada data that erroneously showed a boom in the Anglo population as proof that the community is continuing to wither but said the recent announcement of a secretariat for Anglophone affairs is a good step. “The civil service, again 35 years later is still homogenous, monolithic French Canadians from Quebec,” he said. Birnbaum also touted the secretariat as a move in the right direction but acknowledged there are still many issues that need resolution before wayward Anglos can be convinced to return. However, he does see the relationship between Anglos and Francos changing on a fundamental and mutually beneficial level. 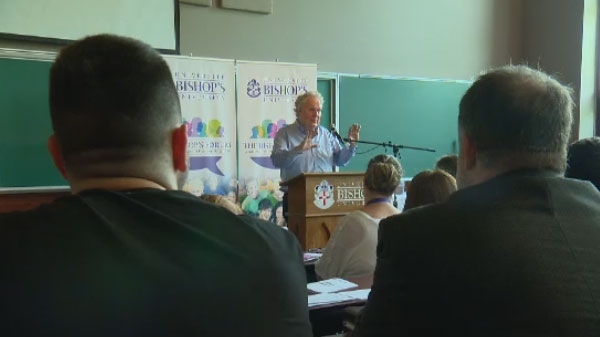 Former Quebec premier Jean Charest addresses university students at the inaugural Bishop's Forum.